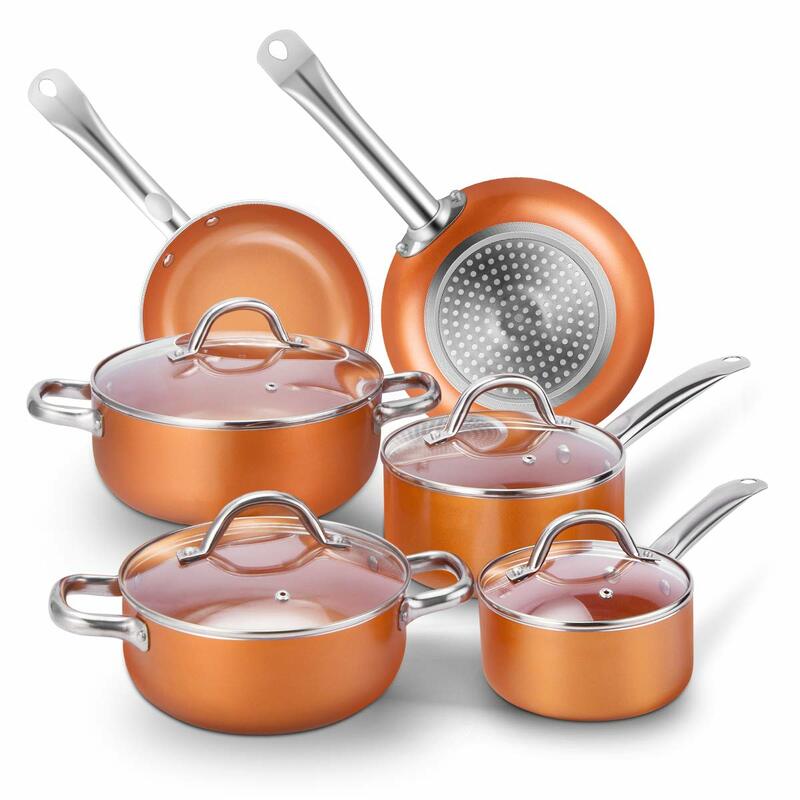 This cookware set comes with 2 * fry pan (Ø 10.5 inch, Ø 8.11 inch) , a 4-quart stockpot with a matching glass lid, a 2.5-quart saucepot with a matching glass lid, 2* sauce pan (2-quart, 1.5-quart ) with matching glass lid. Pans & Pots with Ceramic Nonstick Coating: Easy to clean, use less oil and food slides easily without sticking to the surface. More importantly, unlike traditional Non-stick coatings, you don’t have to worry about toxins given off when heated up. Aluminum cookware: Compare with the ordinary stainless steel cookware, the aluminum pans/ pots heat food more quickly and evenly. This not only saves energy but also a lot of time. More over, its light weight makes cooking more easy. CONTAINS: 2 * fry pan (Ø 10.5 inch, Ø 8.11 inch) , 4-quart stockpot with a matching glass lid, a 2.5-quart sauce pot with a matching glass lid, a 2* sauce pan (2-quart, 1.5-quart ) with matching glass lid. CERAMIC NONSTICK COATING: Easy to clean, it use less oil and food slides easily without sticking to the surface. More importantly, unlike traditional Non-stick coatings, you don’t have to worry about toxins given off when heated up. PTFE free, PFOA free. STAINLESSSTEEL BONDED BASE: Even heating, Heating Speed Improves 50%, Suitable for iInduction, electric, gas, ceramic, glass, halogen and solid cookers. GLASS LID: With a glass lid you can easily monitor cooking, and it help retain heat and moisture. PRACTICAL STAINLESS STEEL METAL HANDLES: Oven safe, ergonomically shaped handles in polished stainless steel. Suitable for: Induction, electric, gas, ceramic, glass, halogen and solid cookers. All products are compliant with GS and ROHS.